Watch your child drift off to dino dreamland with these mini realistically detailed dinosaurs. Dinosaur fans will love these colorful, soft body dinosaur figures. Inspire imaginative play and curiosity about science. Kids will enjoy hours of imaginative play with these realistic looking dinosaurs. Fun and educational for both boys and girls alike. Just right for a school / science project or report. Ideal party favor or gift for a dinosaur themed birthday party. 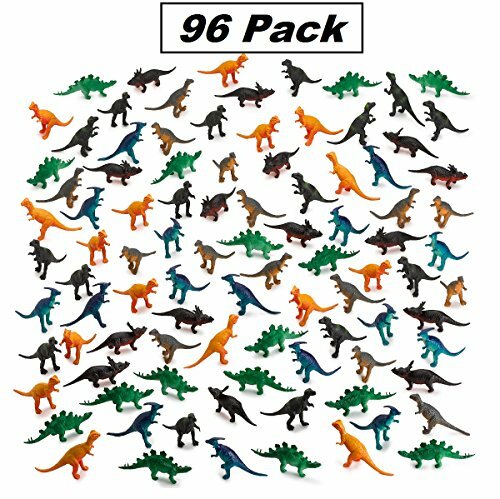 Pack includes 96 assorted mini Dinosaurs which measure 2 inches. Another great toy from Kidsco! WHAT YOU GET - Pack of 96 Vinyl 2" Dinosaurs in assorted colors and species which provide hours of imaginative and educational play! For ages 5 and up. HIGH QUALITY - These Dinosaur action figures are completely safe and non-toxic. It is made of vinyl. No tiny removable parts. Passed EN71 test standards. BPA, lead-free. All products undergo a vigorous inspection and examination process before it has been safely packaged and approved for shipment. FUN AND EDUCATIONAL - Enhance imaginative play, memorization, recall & foster kids science curiosities. Our figurines make the perfect novelty toy for kids. GREAT TOY - This is an awesome novelty play set to motivate Kids, Students or Friends. They will be inspired to hear the history and science of Dinosaurs. Teach them their names, shapes and colors. PARTY FAVOR - Ideal for party favor or gift at a dinosaur themed birthday party. Sturdy but not super hard. Children will love this wonderful animal set. You can add them to enhance your jungle safari or just for any themed decoration. If you have any questions about this product by Kidsco, contact us by completing and submitting the form below. If you are looking for a specif part number, please include it with your message.